This sumptuous armor was custom made for a samurai of the mid to late Edo period (c.1800). Incorporating fine silk brocade with an impressive pattern of coiled dragons, this armor features a ferocious iron mask and substantial 32 plate iron helmet. The demon forecrest with glass eyes, combined with the rare and luxurious mane of animal hair evoke the battle garb of the legendary warrior Takeda Shingen. Shingen was an accompllished poet and legendary samurai warrior of the 16th century. At the battle of Kawanakajima, he defended himself in direct combat with his rival, Uesugi Kenshin, using only an iron fan against Kenshin's sword. A formidable lord and general, Shingen rivaled Oda Nobunaga and Tokugawa Ieyasu for control of vast swaths of Japan. The film Kagemusha, by director Akira Kurosawa, loosely depicts a well-known version of Shingen's death in which a single sniper shot him at night. 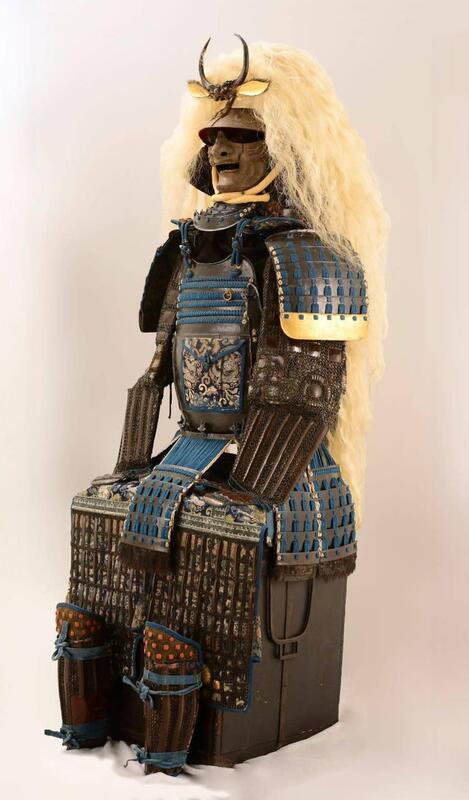 Twentieth century reproductions of Shingen's armor are widely available. This genuine armor was produced for a samurai over 200 years ago. Can also be mounted in a standing position or on a pedestal. Custom stands available from us separately.